Peroral endoscopic myotomy (POEM) is a novel minimally invasive technique that has emerged as the preferred option for the treatment of achalasia and spastic esophageal disorders (SED) at many centers around the world. In this article, we review and summarize the recent literature on POEM in patients with achalasia and SED. 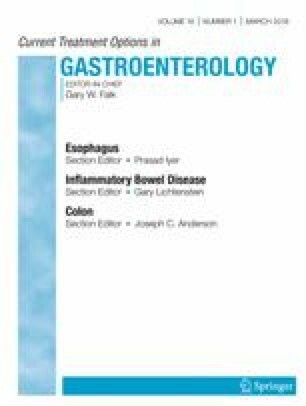 The current article is largely focused on the new developments and findings, extended applications, and long-term outcomes of POEM in patients with achalasia and SED. POEM is a safe and effective therapy for patients with achalasia and SED. POEM is comparable to Heller myotomy (HM) in terms of safety, efficacy, and complications, including gastroesophageal reflux disease (GERD). Outcomes of POEM are excellent even in patients who had prior failed therapies for achalasia, including failed HM and prior POEM. Recent data also suggest the efficacy and safety of POEM in both pediatric and geriatric patients. GERD after POEM is common, and the majority of patients are asymptomatic. The management, goals of therapy, and long-term outcomes of GERD after POEM are unclear. Objective testing for all patients is recommended. POEM is a validated treatment for all patients with achalasia and SED. Candidates should be carefully selected and appropriately counseled on expected outcomes and the need for long-term surveillance. Nasim Parsa declares no conflict of interest. Mouen A. Khashab is a consultant for Boston Scientific and Olympus America. He also serves on the medical advisory board of Boston Scientific and Olympus America. ••Teitelbaum EN, Dunst CM, Reavis KM, Sharata AM, Ward MA, DeMeester SR, et al. Clinical outcomes five years after POEM for treatment of primary esophageal motility disorders. Surg Endosc. 2017; https://doi.org/10.1007/s00464-017-5699-2. First study to report POEM outcomes with a mean follow-up time of 5 years, with a clinical success rate of 83%. They reported an improvement in the mean Eckardt scores at 6 months and 2 years, but there was a small but significant worsening of Eckardt scores at 5 years, emphasizing the importance of long-term follow-up in all patients.